Joey Bishop, the stone-faced comedian who found success in nightclubs, television and movies but became most famous as a member of Frank Sinatra's Rat Pack, has died at 89. He was the group's last surviving member. Peter Lawford died in 1984, Sammy Davis Jr. in 1990, Dean Martin in 1995, and Sinatra in 1998. Bishop died Wednesday night of multiple causes at his home in Newport Beach, publicist and longtime friend Warren Cowan said Thursday. The Rat Pack became a show business sensation in the early 1960s, appearing at the Sands Hotel in Las Vegas in shows that combined music and comedy in a seemingly chaotic manner. Reviewers often claimed that Bishop played a minor role, but Sinatra knew otherwise. He termed the comedian "the Hub of the Big Wheel," with Bishop coming up with some of the best one-liners and beginning many jokes with his favorite phrase, "Son of a gun!" The quintet lived it up whenever members were free of their own commitments. They appeared together in such films as "Ocean's Eleven" and "Sergeants 3" and proudly gave honorary membership to a certain fun-loving politician from Massachusetts, John F. Kennedy, at whose inauguration gala Bishop served as master of ceremonies. The Rat Pack faded after Kennedy's assassination, but the late 1990s brought a renaissance, with the group depicted in an HBO movie and portrayed by imitators in Las Vegas and elsewhere. The movie "Ocean's Eleven" was even remade in 2003 with George Clooney and Brad Pitt in the lead roles. Bishop defended his fellow performers' rowdy reputations in a 1998 interview. "Are we remembered as being drunk and chasing broads?" he asked. "I never saw Frank, Dean, Sammy or Peter drunk during performances. That was only a gag. And do you believe these guys had to chase broads? They had to chase 'em away." Away from the Rat Pack, Bishop starred in two TV series, both called "The Joey Bishop Show." The first, an NBC sitcom, got off to a rocky start in 1961. Critical and audience response was generally negative, and the second season brought a change in format. The third season brought a change in network, with the show moving to ABC, but nothing seemed to help and it was canceled in 1965. In the first series, Bishop played a TV talk show host. Then, he really became a TV talk show host. His program was started by ABC in 1967 as a challenge to Johnny Carson's immensely popular "The Tonight Show." Like Carson, Bishop sat behind a desk and bantered with a sidekick, TV newcomer Regis Philbin. But despite an impressive guest list and outrageous stunts, Bishop couldn't dent Carson's ratings, and "The Joey Bishop Show" was canceled after two seasons. Bishop then became a familiar guest figure in TV variety shows and as sub for vacationing talk show hosts, filling in for Carson 205 times. He also played character roles in such movies as "The Naked and the Dead" ("I played both roles"), "Onion-head," "Johnny Cool," "Texas Across the River," "Who's Minding the Mint?" "Valley of the Dolls" and "The Delta Force." His comedic schooling came from vaudeville, burlesque and nightclubs. Skipping his last high school semester in Philadelphia, he formed a music and comedy act with two other boys, and they played clubs in Pennsylvania and New Jersey. They called themselves the Bishop Brothers, borrowing the name from their driver, Glenn Bishop. 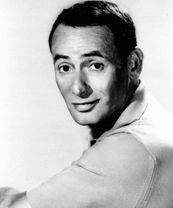 Joseph Abraham Gottlieb would eventually adopt Joey Bishop as his stage name. When his partners got drafted, Bishop went to work as a single, playing his first solo date in Cleveland at the well-named El Dumpo. During these early years he developed his style: laid-back drollery, with surprise throwaway lines. After 3 1/2 years in the Army, Bishop resumed his career in 1945. Within five years he was earning $1,000 a week at New York's Latin Quarter. Sinatra saw him there one night and hired him as opening act. While most members of the Sinatra entourage treated the great man gingerly, Bishop had no inhibitions. He would tell audiences that the group's leader hadn't ignored him: "He spoke to me backstage; he told me `Get out of the way.'" When Sinatra almost drowned filming a movie scene in Hawaii, Bishop wired him: "I thought you could walk on water." Born in New York's borough of the Bronx, Bishop was the youngest of five children of two immigrants from Eastern Europe. When he was 3 months old the family moved to South Philadelphia, where he attended public schools. He recalled being an indifferent student, once remarking, "In kindergarten, I flunked sand pile." In 1941 Bishop married Sylvia Ruzga and, despite the rigors of a show business career, the marriage survived until her death in 1999. Bishop, who had one son, Larry, spent his retirement years on the upscale Lido Isle in Southern California's Newport Bay.